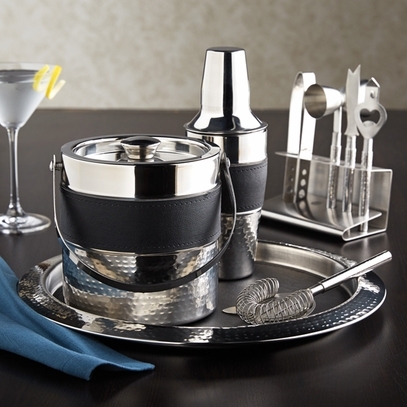 Here’s everything the consummate bartender needs. Distinctively designed in hammered stainless steel with sleek black leather accents. Included: tray, 14½" dia. ; ice bucket, 6" dia. x 6¼"h; shaker, 3½" dia. x 9½"h.; four tools, plus ice tongs.